Lyndal is my wife. We were married earlier in the year. Thanks for your congratulations. She said something to me a month and a half ago about wanting to only listen to music from 2015 in 2015. Lyndal’s workplace includes a factory floor where they continuously blare one of those radio stations that plays "hits from the 70s, 80s, and 90s". Not only is it old music, it’s the same old music this station has played for the last twenty years. This stuck with me: our reliance on nostalgia fools us into thinking the past was better than the presence. This is true of every generation and, therefore, either means that the cultural world (music, television, radio, film, literature) is getting worse over time or that everyone is wrong. I have my comfort music. 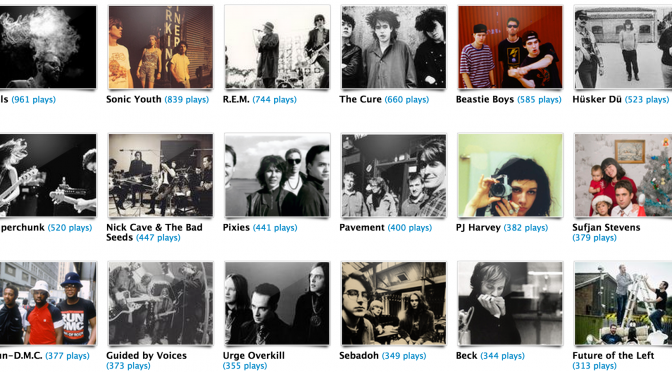 My Last FM library is a monument to who I was two decades ago. Only one band stands out as being truly current in that list. Future of the Left played in Austin, Texas when I was there in 2012. I felt something unexperienced for such a long time: excitement for music I had never before heard. This used to happen to me a lot. I used to see live music a lot more and make sure I was always there for the support acts. I saw Magic Dirt supporting the Smashing Pumpkins and the Avalanches as the bottom of the bill on a Jon Spencer show. After both those shows I rushed out the next day to buy whatever I could these bands had produced. In the last two years I’ve listened to Future of the Left so much that that band has made it into my top 18 artists on Last FM. That excitement for new music is rare for me, these days. Lyndal’s comment may have been throwaway but it kept gnawing at me. (Incidentally, the Big Star record finished and I’ve followed it with Teenage Fanclub’s Man-Made.) How would I go for a year without listening to any old music? What constraints would I come up with to maintain integrity? Where does new music even come from? When I suggested to her that I join her on this discovery of the new, Lyndal admitted to also thinking about it a lot. It wouldn’t just be music, she said. It would be as much of our cultural consumption as we could conceivably arrange. This challenge will consume of for the next year.